Australian poker legend Jeff Lisandor made his 19th World Series of Poker final table on Friday and ultimately finished 5th place in the $10,000 Seven Card Stud Hi-Low Championship. If the World Series of Poker is the ultimate measuring stick for poker greatness then it is arguable that Jeff Lisandro is Australia’s all-time most successful poker player. Sure, Joe Hachem won the WSOP Main Event in 2005, but Lisandro has five gold bracelets to his name and on Friday made his 19th lifetime WSOP final table. The event was $10,000 Seven Card Stud Hi-Low Championship and Lisandro was one of 134 elite players trying their hand at WSOP glory. Lisandro already has four bracelets in stud variant games on his resume and so would certainly be one of the better players in what was a tough field. Running as a three-day event, the players started with 30,000 in chips and Lisandro got through Day 1 as one of 75 survivors and with a stack of 43,400. When a long Day 2 was finally in the record books, Lisandro and 12 others bagged up chips, with Lisandro having 420,000 – the second largest stack behind Germany’s George Danzer (785,000). The plan on Day 3 was to play down from 13 to 1 and at this point the players had locked up $25,569. Todd Brunson (13th) was the first player eliminated prior to the final table, while Ted Forrest (11th) and WSOP broadcaster Norman Chad (10th) also missed out on the final table. When Richard Sklar (9th) and John Monnette (8th) were eliminated on the same hand, a seven-handed official final table was formed. 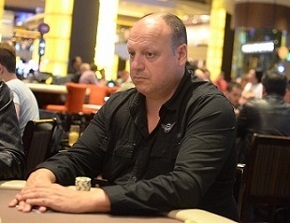 Lisandro was fourth in chips at this point, while Danzer has maintained his lead and was the only player with a seven-figure stack. David Singer (7th) and Chris George (6th) quickly hit the felt before Lisandro himself would eventually play his final hand of the tournament. Lisandro had started the hand with monster pocket aces, but Hastings had rolled up queens. No player made a qualifying low and with Lisandro only improving to two-pair, Hastings took down the pot with three queens and sent Lisandro home in 5th place. That result sees Lisandro’s lifetime tournament winnings move above US$5,340,000 and was his 55th WSOP cash and 19th WSOP final table appearance. Lisandro is one of the WSOP’s most decorated stud players of all time, being 7th on the all-time WSOP Stud money list, 3rd on the all-time Stud Hi-Low list and 4th on all-time Razz list. Once Lisandro was eliminated from the final table, Germany’s Danzer ran over his opponents and ultimately claimed the victory and the $352,696 top prize. This was Danzer’s second gold bracelet of the 2014 WSOP after having won the $10,000 Razz event just a couple of weeks ago. Danzer is the first player to win two bracelets this year so far. Remember to return to Poker Asia Pacific for all the latest news and results from local players at the 2014 WSOP. You can check out some of those local results so far in part one of our 2014 Asia-Pacific WSOP results article.